A Reliable, Well-Developed and Professional Manufacturer of LCD Arms and TV Mounts. 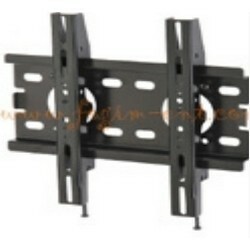 LCD TV Bracket-up To 37"
TKLA-8324 LCD TV Wall Mount applies to LCD TV/Plasma TV up to 37”. It is very easy for the professional personnel to install and also very easy to dismantle. Save a lot of space for the users by lifting up the bulky TV from the cabinet and mounting on the wall. LCD TV Bracket-Up to 42"